Amethyst it relieves stress and strain, soothes irritability, balances mood swings, dispels anger, rage, fear and anxiety. Alleviates sadness and grief, and dissolves negativity. 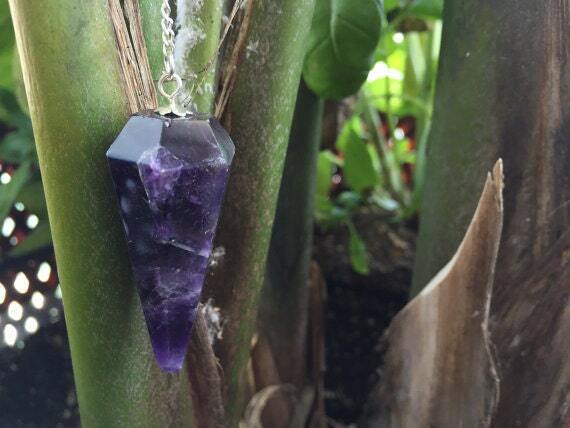 Amethyst activates spiritual awareness, opens intuition and enhances psychic abilities. It has strong healing and cleansing powers. The pendulum measures 1.5"-2" long. This pendulum can be converted into a pendant to be worn with a necklace. *Select Pendulum or Pendant with CHAIN size during check out. Love the seller, great communication. Great item, timely shipping.